You can see an egg as the bird changes positions while incubating. 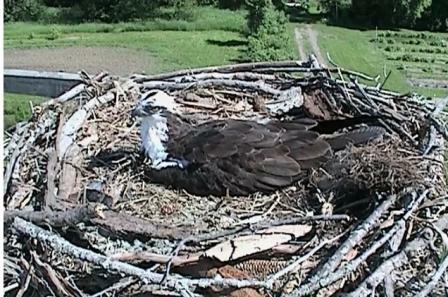 You can watch the osprey cam at the Minnesota Landscape Arboretum. The male has been returning to the area since 2003, and is 21 years old. The female is new this year and is three years old. This nest pole was erected in 2001 in response to ospreys attempting to build a nest on an electric line. 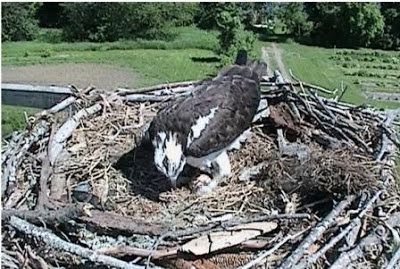 Both osprey worked together to create the nest, with the male bringing in up to 4’ long branches, and the female inter-weaving with other sticks in the nest. 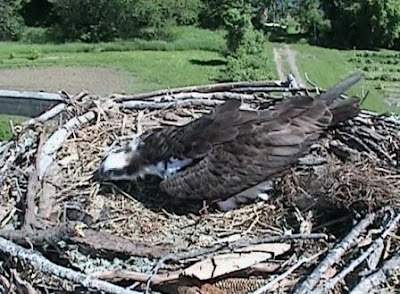 Once eggs are laid (typically 1-3), the osprey take turns incubating the eggs. 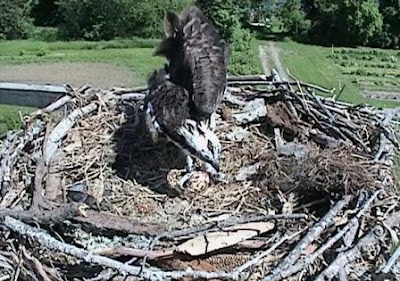 When the chicks are 10 days old, they are already mobile and eat 1-3 lbs. of food per day. You might also be interested in the history of work done on some osprey migration tracking. Mark Martell, formerly of TRC and who now works for Audubon Minnesota, put transmitters on birds in the US, and tracked their annual migrations from breeding grounds to wintering grounds in Central and South America. An interesting bit learned from this project is that East coast birds all go down the east coast, some fairly far inland, some along the coast proper, to the tip of Florida, over to Cuba, and then on to Hispaniola (Haiti and the Dominican Republic). Some winter in the Caribbean, but the majority make the 4-500 mile trip across the Caribbean to Venezuela. 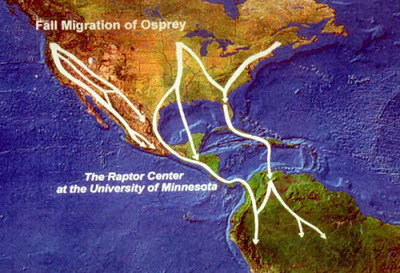 From there, they scatter across much of the South American continent, some going as far as the Pantanal in Paraguay and Southwestern Brazil. Some truly overachieving birds even make it to Argentina! 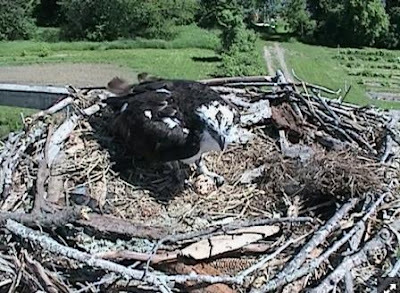 The bird will occasionally adjust the nest material.